Define Social Darwinism and Discuss the reasons for the acceptance of the philosophy of Social Darwinism by the American people. As discussed, the American frontier created an environment for social mobility in society. The opportunity for this social mobility existed because the frontier had no pre-existing social structure. Hence, only those who could adjust to the environment would survive and have a chance to be successful. The concept of survival of the fittest (Social Darwinism) developed in the landed frontier and was seen as a natural process. Due to the practice of Social Darwinism on the landed frontier, the philosophy of Social Darwinism became widely accepted when introduced in America as an explanation and a justification of the wealth and power held by the new rich . There were three basic reasons for America's acceptance of the social, economic , and moral philosophy of Social Darwinism. As discussed under the landed frontier, the experiences that people encountered helped to foster the idea of laissez-faire since it supported individualism and the idea that man and society benefit from competition. As the landed frontier was on its last leg of existence, its concepts were being applied to the new industrial frontier with some serious repercussions; i.e. the railroads and their abuses. The second reason behind the acceptance of Social Darwinism was the philosophy of laissez-faire. The political Compromise of 1877 marked the end of Reconstruction after the Civil War and the end of an era of strong government influence within society. It marked the beginning of another era, that of laissez-faire. Laissez-faire was the foundation upon which the social and economic philosophy of Social Darwinism was built, and its roots were planted deeply in American History. The argument of laissez-fair is that where there is no to little government regulation of the economy, the economy will thrive In 1776, the economist named Adam Smith wrote a book called A Wealth of Nations. Smith put forward his "invisible hand" or laissez-faire (the idea that natural laws would govern society). Smith felt that a free economy was one that operated within an environment run strictly by the law of supply and demand. Such a law posits that people are rational actors who purchase high quality products at the lowest price possible. Such a market place would produce all the goods and services a society needed and the need for government interference would be marginal and counterproductive. Smith's philosophy is only valid up to a point. His argument becomes invalid with the development of the corporation that produces goods for a mass market. Smith was writing for a simpler society where there were many producers competing for a local market. Smith's arguments stemmed from American colonists' bad experience with government regulation from England in the mid-1770's. Because of this, they wanted a weak central government, which would allow them economic self-determination. The colonists had also developed a laissez-faire economy during their first 150 years or so of development. During that time period, England neglected the development of the colonies. There is a good argument that laissez-faire is just as good today as it was during Adam Smith's time. The argument holds that, even in a corporate society, laissez-faire works under the COUNTERVAILING POWER theory. The theory argues that a person should be able to charge any price for their product , regardless of whether they have a monopoly or not. If the price is so high that it leads to great profits , those profits will encourage someone to develop a "countervailing power." "Countervailing power" is a product that provides the same service or function as the high priced product , but is a different product altogether. For example, if someone had a monopoly on wax paper and charged $10.00 a box, the "countervailing power" theory holds that someone would develop saran wrap and sell it for less. This new product would force the makers of the old product to lower the price of their product in order to be competitive. The final factor that influenced the acceptance of Social Darwinism was the Protestant Work Ethic or the Puritan theory. This theory held that God helps those that help themselves . Hard work and thrift lead to prosperity , and success comes as a result of God and His grace. If someone was successful , it was considered a sign from God that they were doing the right thing in life, thereby fulfilling their destiny. Under these theories , there was no need to feel ashamed or guilty for having wealth while others went hungry. The wealth and power one accumulated was a result of God's will ; thus, it was deserved . Consequently , the highest of all authorities was used to justify the wealth and power that came from opportunities provided by the American frontiers. This philosophy was best represented by Andrew Carnegie. 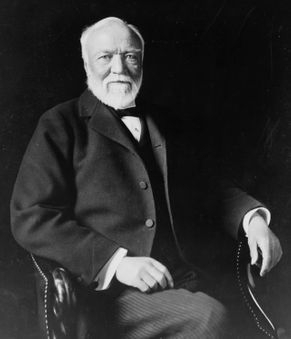 Carnegie was a typical businessman of the time. He fashioned and publicized a philosophy for big business which was a conservative rationale and became deeply implanted in the conventional wisdom of Americans. In 1889, Carnegie published an essay in the NORTH AMERICAN REVIEW entitled "Wealth," which was later re-titled "the Gospel of Wealth" when reprinted in England. In the evolution of society, Carnegie argued , the contrast between the millionaires and the laborer measures, the distance that society has come. "Not evil, but goo·d, has come to the race frorr"the accumulation of wealth by those who have the ability and energy that produces it. " The process had been costly in many ways, but the law of competition 'best or the race, because it insures• the survival of the fittest"
wise. He might leave it at his death for public uses, but in his absence it would likely be misused. The best way to dispense with a fortune was to administer it during one's lifetime for the public good. Carnegie felt one should avoid alms-giving, but rather provide a means for them to help themselves by supporting universities, libraries, hospitals, ·for meetings. To his credit, Carnegie set an excellent example, devoting his wealth to many such benefactions and to the cause of world peace. Carnegie's gospel of wealth found widespread acceptance in the late nineteenth century's worship of success, and helped develop an attitude of respect for the self-made man.